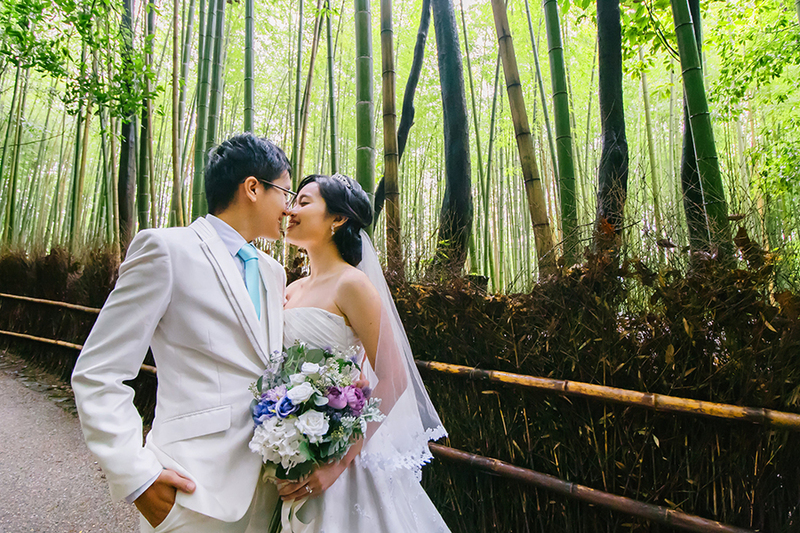 Reach us at +65 85852052 (Adeline/ Caleb) to check your wedding day availability BEFORE you make any bookings. 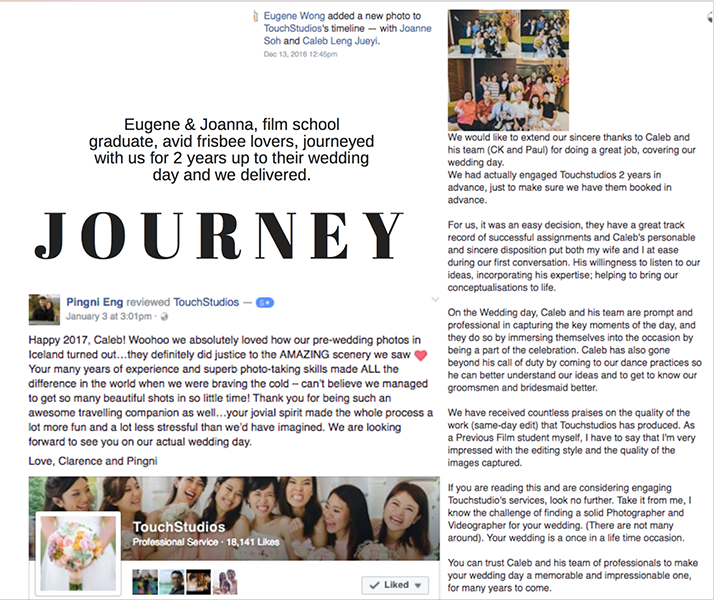 Unlike any in Singapore, Touch is the only team who serves a limited amount of couples who journey with us from their proposal to prewedding to wedding day. (36 couples a year), no more. This allows us to dedicated time to know you and journey with you, at the heart of it, we are all about the journey. Entrance to attractions and shoot transport. It really depends on whether you'd like to go on foot, metro, self drive or chauffeur driven. Depending on the destination, we're happy to advise you. Our priority is maximum cost savings without compromising on comfort. I'd like to do a road trip which is more than 3 days, do you have something for me? Consider our Annual Travelogue Package at $3880, we are happy to covert your 1 City (1 Day) + Singapore (1 Day) package into a 1 City (3 Days Shoot) for just $350. This will allow you to go further and explore different towns! What about makeup artist and hair styling? There are 3 ways to go about. 2) Engage a local makeup artist - You may look for one online, usually ranges between $500 - $800/day. 1 Day will be sufficient, preferably 2 looks. You will just need it for the gown shoot day. 3) Self learning! It's way easier than you think! Takes just 2 days to learn it based on our couple's experience and it's a lifelong skill. We've helped compile these tutorials which we are 100% sure will be sufficient for you. Off course, practice makes perfect! Do we have to provide meals for you during the shoot? Just click on the "Get In Touch" tab below or whatsapp us at +65 85852052 and shoot away with your question. We'd love to touch base with you and assist you with any queries. Should we be able to serve you, we'll prepare a contract and send it to your email within 24 hours. You may choose to secure your promo rates online or via bank transfer, both ways allow for transparency and accountability. 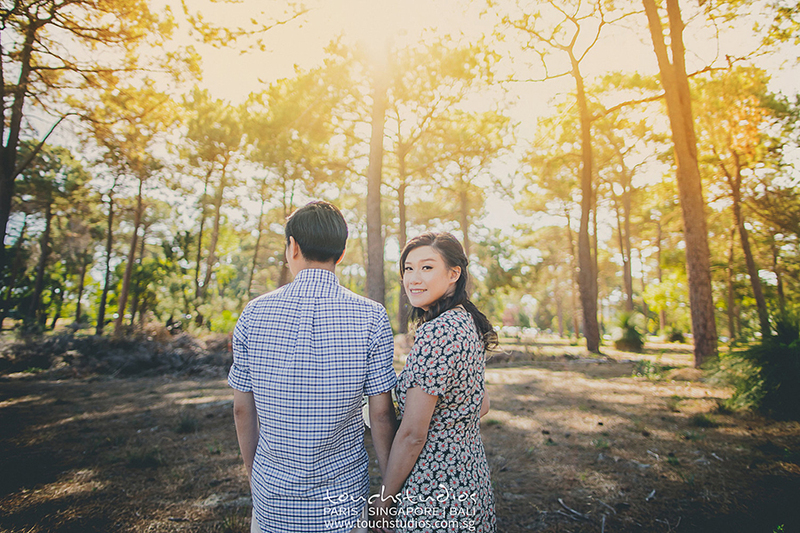 When can I expect to receive the final images after the Prewedding? We usually require 6 - 8 months for our images will be fully edited and sent to you via a link for download. This includes dedicated time to filter, edit, process and deliver your images. Should you like it faster, simply make a request and we'll do our best to bump you up the queue to 8 to 12 weeks after the shoot. You may also op for a Touch Express Edit at just 12 working days $280 assuming you require only 1 round of change. 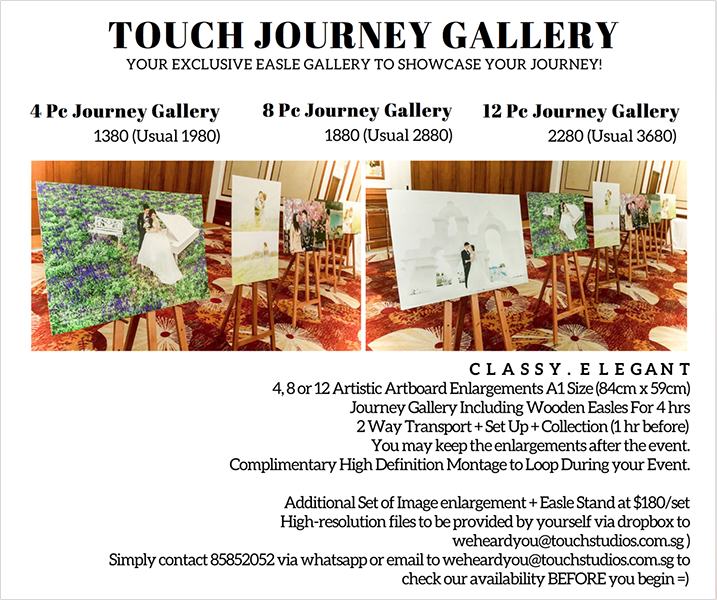 Albums or Touch Journey Galleries (A1 Art Boards) are usually ready within the same week of your prewedding. Do I need to meet-up with you before I proceed to book you? Who decides the locations? No meet-up is required before you book us. Our portfolio works are available online for your viewing. If you need any clarification or discussion, we will love to give you a friendly phone call or within 2 to 4 weeks of your shoot date, we can also arrange for a meet up to touch base and discuss on the locations you'd like. Our couples usually share with us their favourite locations based on a 1 or 3 day shoot schedule. In situations where you are not sure, we're always happy to advise you like we've done for many of our couples! We're really flexible about this! We can usually fit safely 3 major locations within a day, each location includes walkabouts. 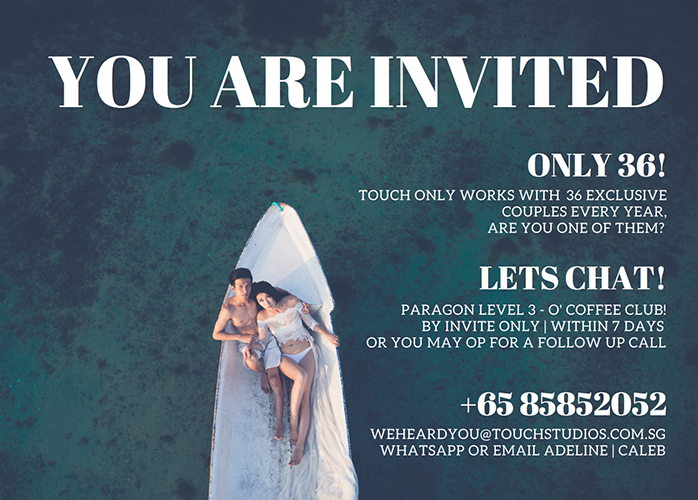 For Paris and Bali, shoots will be done by our local Touch team, other destinations like Australia, New Zealand, Iceland, Korea and Japan will be covered by Master Touch Caleb. Lastly, why should we come onboard this Journey with Touch? You don't want your wedding with horrible template like photos. You don't want your wedding photographer to be awkward and doesn't know how to interact with your guest. If you are looking for an established team with 9 years of track record delivering beautiful moments for more than 340 couples served till date, one who genuinely cares as much as you do for your own wedding, you've come to the right place!